Readers will notice i gave the right direction and support level on SPY yesterday. 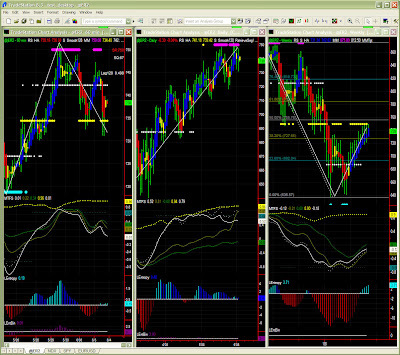 On EURUSD, shorter time frames are recommended and are very easy to read. About NDX, i warned of a stall situation 3 days ago. I admittedly didn't venture into a specific scenario, which proved to be a little erratic yet tradable on a 30mins TF. A lower time frame is again recommended for directional traders. MTFS is now turning into a down drifting situation. It seems the 2000 level while being a pivot has lost some of its significance and we may now see a trading range. 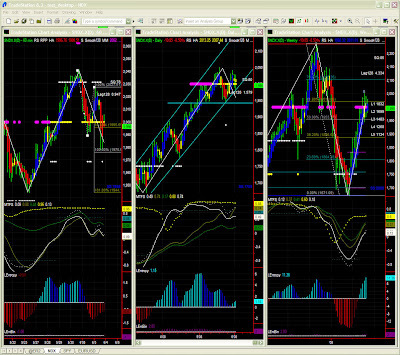 NDX may develop a Fib pattern, however easier to read on a 30mins chart. To mitigate that scenario however, we will notice that Entropy is relatively weak, indicating possible congestion or a slow down drift. No change from last NDX post: NDX is in a congestion phase with a remaining slight upward bias. We will also be cautious about this indecision by checking the channel lows. Pivot number 5 (2050) could indeed turn into a full downward Fib pattern (target 1700), or could still be erased to take NDX back to last year's highs (>2200). Again the cautiously bullish scenario is still favoured for now and confirmation should come within weeks. 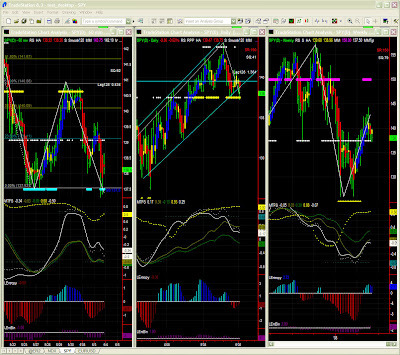 Since this is not the dominant time frames, clues will certainly arise from lower time frame indicators.